Psypoke - View topic - Massive advertisement: want more Psybucks? Massive advertisement: want more Psybucks? This is the act of repeatedly "flooding" the channel with text. For example, pressing a and pressing enter numerous times would be flooding. If you are copying and pasting something, it better be interesting and relevant, otherwise it's just spam. The ops are allowed to flood. Constantly asking for trades/battles, asking ASL, typing liek u dont no how 2 use a keybord or dictionery, using excessive ellipses and ampersands, FLOODING, posting unfunny youtube videos, advertising other Pokemon websites that are not relevant to the conversation, etc. 3.) Everything that is not safe for work should be MARKED as NSFW. We don't encourage you to post something inappropriate, but sometimes it happens. If it does, PLEASE bold your NSFW warning. I'd prefer if you only did it when random Psypoke guests aren't around, or people you know would be offended. Illegal content is not allowed. 4.) Everything must abide by the MOTD (message of the day). We do not own the network, Keyboard Failure, that our channel resides on. None of us are affiliated with the staff of this network, so if you **** up and they gline you, we will not care/bail you out of trouble. As guests on their network I WILL say: If you join other channels and advertise our channel/make us look bad, you WILL be banned from the forums. People use many different IRC clients, and have many different background colors. If you use a certain color of text it might conflict with someone's background color, so we ask that you please do not use color. Can do whatever to the channel, including dropping it. Considered the founder, thus getting a tilde. Can promote any user to any level. Can set most channel modes. Can ban users. Can do pretty much everything a Founder can, except they cannot drop or change the channel password. Has an &. Can promote operators and below. Can set some modes. Can ban/kick users. skullkid, Flaming_Wuzzle, DatVu (whenever he decides to return). Can set a few modes. Can ban/kick users. Considered an asset to the channel, although they can not ban users or set any modes. It is likely they will be promoted sometime, when one of the above users dies. As you can see, we have many forum moderators that are not channel staff and many channel staff that are not forum moderators. We occasionally promote users to voice, depending on how active they are and contributions made to the conversation. We hope to see you in our chatroom! *** Psybucks will be awarded once Krisp decides you have spent a decent amount of time there. Consider this like a free trial, you have nothing to lose! Re: Massive advertisement: want more Psybucks? Excellent idea Krisp! But if nothing else, I appreciate knowing the difference between cofounders, super-operators & so on. Just as a shout-out to anyone who wants to try it: it's really fun! It's a totally different experience from the forums. However, language DOES get a little strong sometimes, so be warned. Other than that, it's a fun thing to try! To be honest, I'm a slow typer, and my knowledge of popular acronyms is very small. I'll have to pass on the chats, but it does sound fun-ish. You don't have to type fast. And you learn the acronyms as you go. But your choice, I guess. I was checking out the Chat, and it said you had to be older than 16. Is that rule upheld strongly? Because I'm 13, and was going to try it because it sounded like fun. I was just wondering. It's got wires that vibrate, and give music; what can this thing be that I've found? Sounds that build high like a mountain, and notes that fall gently like rain." We only put up that warning because sometimes we use strong language. There is no age limit. Haha she said sometimes. I joined the chats today and it seems pretty cool. Plus I have the desire to be a Mod haha. I don't recall anywhere in the initial post where Krisp said anything about becoming mod. A possible +v status does not equal mod status. It basically just means the staff likes you (and that you can talk under +m). An interesting promotion for the chat to be sure. I'm not in it for the rewards or anything since lurking hanging out on the chatroom is fun in and of itself. It's a very cool place to be sure, with many highly entertaining people. It's something more to be experienced than talked about. And man, that sounded much better in my head. Cool, thanks for the info! I'll check out the chat! One Question: Do I have to pay that 20$ register fee for the one website? Never mind. I clicked on the Java Applet link and it popped up. If no one goes there than tell me. Kind of hard to figure out how to use that chat. You guys should use xat for your chats instead but i'll come along every so often. You guys should get stasbot back, that chats page always made it fun to see what your quote of the day would be. :p I went to look for the link since its quotes are all still from summer 2009 but I cant remember the link. I dont think you have to pay to use mIRC, I didnt, but I removed it after that summer since I just find the applet easier. There was a free trial I think, and I just let it run the "unsafe" stuff since I cant imagine that #psypoke is out to get me. I'll try to go onto the chats more, I miss them. mIRC doesn't actually make you pay for it, it just tries to make you believe you do. all you really have to do is wait for a few extra seconds before it lets you in. And the java applet is completely safe, don't worry. For the mIRC thing, just keep in mind that the trial never actually expires. Some people's trials have gotten to something outrageous like 500 out of 30 days and stuff, so it's just that few extra seconds of waiting. There's no paying actually needed. Mibbit - When your computer doesn't like Java, when you're too lazy to download mIRC for yourself, or when you're at a library and don't have a choice. If you do Mibbit, I reccomend signing up for an account. It's free, and they don't ask for personal information, and it allows you to save your settings (like, when I use mibbit, i hate their smilies, so i disable them; this is saved for every time i log on). 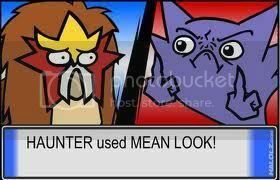 Beating the elite four is easy...just use different types of pokemon and A LOT of hyper potions.